There are 10 posts in this thread, and it has been viewed 8766 times. Super Sidekicks 2. What do you think of it? 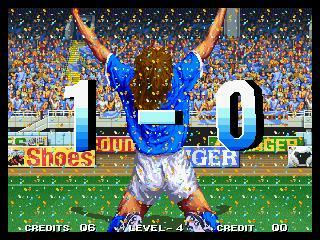 As the Neo Geo library can't really show off with many Sports titles, we deliver this week a certain soccer game from 1994, an overall good year for our beloved Arcade system. Don't let yourself deter by the genre and the fact that there are two other Super Sidekicks sequels out there, this doesn't mean the second installment isn't fun at all. Get together with a friend a have good time with this one (or just join our HSC)! To tell you the truth; I�m really not that into soccer games when playing against the computer. Face off against a friend however, now thats something completely different. It�s as amusing as having a good fight against a friend in KOF or SS. The taunts and the joy of beating the other guy is truly rewarding. I guess ice hockey isn�t that big in JAPAN, otherwise it would have been fun to see how they would have translated that sport into a NEO GEO game. This is not a popular NG title so it would not be unreasonable to see a lack of interest in this GOTW . I have only played it briefly and think that its ok, but its a game of its time that has not aged as well as the 90s NG beat em ups. Back then arcade soccer games were all that was available in the home and arcade so it was fine but sadly they are not a lot of fun to play nowadays. 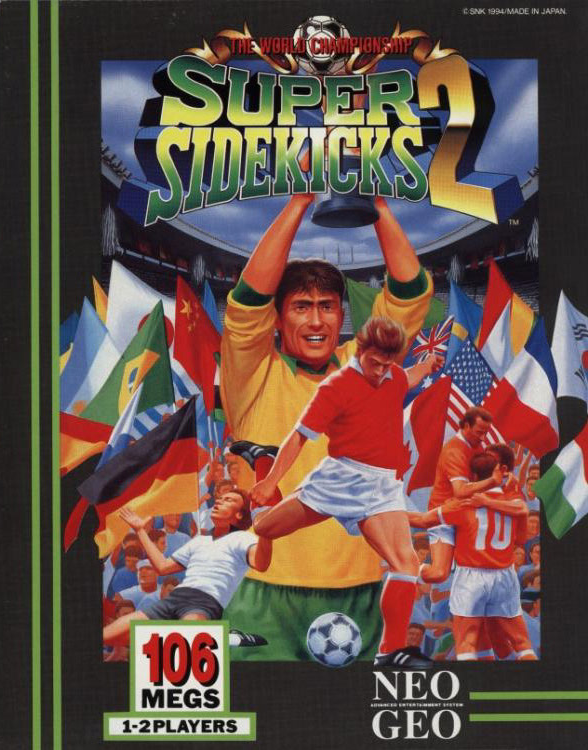 I've always enjoyed the Super Sidekicks series. Not the kind of games I would sit there playing for hours at a time but always fun to have a few matches every so often. The first game was good but this sequel is more polished with better visuals, improved gameplay and a better selection of teams to choose from. It seems a lot easier to score goals than in the first game at least for me. I feel that the sports game genre is one of the Neo Geo's strengths but it sometimes seems as if many people have limited interest in these games. My advice is give them a try even if you don't normally play sports games. You might be surprised how much you enjoy them. What? SS2 is a true classic?! I love the Neo Geo sports games. 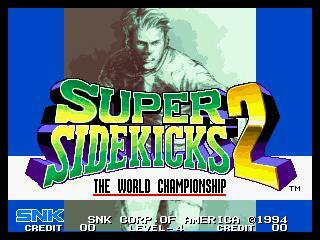 I remember the first time I saw Super Sidekicks 2 in my local arcade back in the days. It blew me away with big sprites, fast and funny gameplay. Today I own the AES version. It's a cool game! I went for the first option due to my complete and utter lack of interest in the game. Hence, I haven't touched a footy game in about 15 years. That one with the Goal Keeper was hilarious! The Neo on the other side has very simplified summaries of what we call soccer, Soccer Brawl might be one of the examples. You don't need more than 3 to 4 buttons, there are even Super moves (in the case of Soccer Brawl) and these games don't give a crap on the Offside rules. As for Super Sidekicks 2, I haven't had the chance to play it properly this week as I was quite busy between studying and filling out my tax declaration. I'll give it a go as soon as I can. This happens to be the first soccer video game I have ever tried to play and even though I had no clue what I was doing I found it to be enjoyable. It's a nice break in the fighting/shumps genre (which I love mind you) that SNK is known for. The game sounds remind you of something along the lines of the KOF series which was amusing in it's own right. Like priest said I would bet it's a blast with another live opponent but the A.I. (for me anyway) was quite the challenge as well. I see myself sticking with this to get better and I'm not even that big of a soccer fan. As my current budget has slowed the pace of my Neo Geo AES collecting, this game represents my single AES acquisition for 2017. Not much to nitpick in Sidekicks 2! 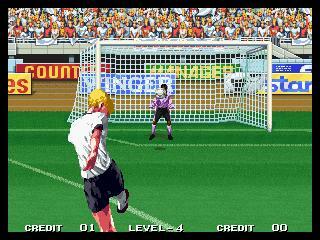 It’s a solid soccer game with simple, responsive gameplay and a cinematic flair that’s distinctly “SNK”. Nice, pseudo-3-D visuals and realistic sounds, crowd cheers and chants enhance a very immersive environment. The difficulty curve is typical of SNK games; starts out easy the first few games then the challenge spikes significantly just when you think you’ve got the AI all figured out. 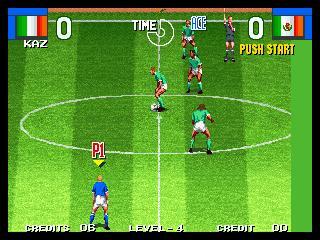 I’ve played enough soccer games to rank a few as favorites worth owning and, along with the Worldwide Soccer series on the Saturn, Sidekicks 2 on the Neo claims high honors. Haven’t played the Sidekicks sequels that followed, so I can’t really weigh in on how they stack up next to SS2.